Wondering How to Sell My Wrecked Car for Cash? 1888PayCashForCars.com has the Answers! When you're in a car accident, there are a lot of things on your mind. You might be injured, and you might have passengers that need attention. If there's another driver involved, you have to find out if they're injured, too. You'll have to talk to law enforcement, and if your car is wrecked, you'll have to find alternate transportation in a hurry. You'll need to talk to your insurance agent. Wondering how to sell my wrecked car might be the last thing on your mind. Maybe it shouldn't be. No matter what insurance settlement you receive, if the car is a total loss, it will be taken to a tow yard, and you'll have to deal with it one way or the other. Once the insurance company declares it a total loss and offers you a settlement, that lump of steel still belongs to you, and it still has value. You should look at it as a way to make money. When your car is towed away after an accident, you might not have been allowed to decide where it went. After an accident, the police call the same tow truck drivers they use to tow away cars that are illegally parked. That's bad for you. These lots are like prisons for cars, and the tow drivers make all their money from holding cars hostage. The longer you leave your wrecked car at the lot, the more likely it is that they'll try to take if from you by charging you a storage fee. These fees quickly exceed the value of the car as salvage. Don't let this happen to you! Contact 1888PayCashForCars.com as soon as possible after an accident, and ask for a free, no-obligation quote on the value of your wrecked car. All you'll need is a few pieces of information like the make, model, mileage, and condition of your car, and you'll get a firm, detailed quote. You'll get an answer fast, and 1888PayCashForCars.com will arrange to tow your car away the same day, no matter where it is. Don't let unscrupulous impound lots steal the value of your wrecked car using storage fees. Towing won't cost you a dime, and it will be off the lot almost immediately. The best part: You'll have the money in your pocket at the same time. No matter what shape your car is in, it has value. Even if the car is wrecked beyond repair, there are many parts of the car that can be removed and sold for big money. 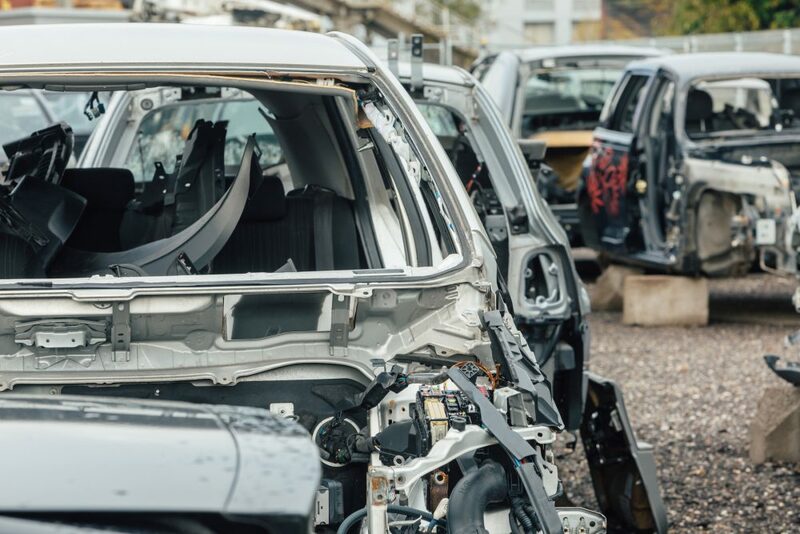 If your car was in good working order before it was wrecked, and especially if it's a recent model year, all the parts of the car that aren't destroyed should be factored into the value of the car. Shady junkyards will not offer you what your car is worth. If you call a junkyard and they tell you that your car is worthless, but they'll take if off your hands for free, you can be sure you're being cheated. That won't happen with 1888PayCashForCars.com. We're honest brokers. We'll make an accurate appraisal of the value of your wrecked car, and we'll make you a fair and firm offer. We handle everything so you don't have to. When 1888PayCashForCars.com buys your car, we send a wrecker out the same day to get your car. There's never any charge for towing, so you know the number you're quoted is the same amount of money you'll receive when we tow the car away. There are many fly-by-night salvage yards that quote you a number, but after the tow driver has your car on the back of his truck, the driver asks you for his towing fee, which could be more than the company offered you for the car. Once your car is on the truck, the driver can demand payment to take it off again. Don't let this happen to you! Contact 1888PayCashForCars.com and you'll get fast, friendly service with no hidden charges. Towing is on us. Payment is immediate and in full. The price you're quoted is the price you'll receive. Don't take a chance! Call us and get some peace of mind - and some cash! What if You Don't Have Insurance? Many drivers operate their autos with the bare minimum of liability insurance. With no collision coverage, your wrecked car might represent the only money you'll have to buy another car. You need to get every dime out of it if you're going to be able to afford another car. No matter what anyone tells you, wrecked cars have value! Even a rusted hulk that's been abandoned in the woods for 50 years can be sold for scrap. Your wrecked car is worth hundreds of dollars. If your insurance isn't going to cover any of the cost of replacing your car, let 1888PayCashForCars.com give you a down payment on your next car. We'll appraise your car for its real value, and we'll put the cash in your hand quickly so you can get back on the road in a new car quickly. Towing is free, and getting a quote is free, so every penny you get for your wrecked car will end up in your pocket! If your car is at an impound lot after an accident, don't delay. They'll begin charging you storage fees if you don't have the car removed within a day or two, and it's a big waste of money to tow a wrecked car from one lot to another, only to have to have it towed again a few days later. There's no reason to pay for storage or towing. Contact 1888PayCashForCars.com right away, and we'll tow it from wherever it's located, usually the same day we strike a deal. If you've been wondering how to sell my wrecked car, you only need to know one name: 1888PayCashForCars.com. Don't wait; contact us today!